Here’s a trivia question. (Don’t scroll down too quickly.) This popular director helmed two films – call them Movie A and Movie B – in the same year. A sequence in Movie A has the central character visiting a studio where a big star is shooting a nightclub scene. As it happens, this is an actual scene from Movie B, which will be released a couple of months later. Name the director and the two films. Answer: Hrishikesh Mukherjee, Gol Maal and Jurmana (both 1979). 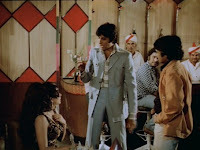 The Amitabh Bachchan drunk scene from Jurmana that briefly plays in Gol Maal can be viewed as a form of in-film advertising for the director’s next release. 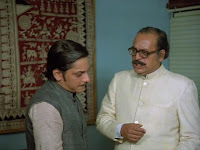 But it’s also an example of two Hrishikesh Mukherjee movies (one a modest, middle-class comedy “starring” that most unassuming of leading men, Amol Palekar; the other a more commercial venture with Bollywood’s biggest superstar) in a little jugalbandhi. And there’s nothing unusual about this if you’re familiar with Mukherjee’s career. His films tend to rework and reexamine certain themes, ideas and character types, so that if you watch a few of them over a short period you see many delicious connections – it’s possible to imagine the films conversing across space and time. Take the varied ways in which the “real” world and the film world intersect in his movies. Playing himself in that Gol Maal cameo, Bachchan signs autographs for a group of schoolgirls and one of them asks him to write “From Anthony Bhai” (presumably a reference to his iconic part in Amar Akbar Anthony). The superstar gives her a wry look. “Accha, toh aapko mera nahin, Anthony ka autography chahiye?” he says. It’s a reminder of an almost identically composed scene from a much earlier Mukherjee film about a starry-eyed schoolgirl being unable to separate Dharmendra the actor from the roles he plays. A different sort of acting takes place in Gol Maal, which is the story of a young man who can hang on to his job only by pretending to be twin brothers with contrasting personalities. It's among my very favourite Hindi films, and I’m hardly alone in this - say "Gol Maal" during a movie conversation and you’re sure to see people’s eyes light up as they recall its prized comic moments and lines. But when I mention that I also find it a very moving, emotionally satisfying film, I sometimes get puzzled reactions (or polite smiles). Many movie buffs – even the ones with eclectic tastes – classify films as “Serious” and “Entertaining” as if these are mutually exclusive categories. Often the classification itself is based on a superficial reading: a film that gives a serious subject heavy-handed treatment (holding the “message” up for everyone to see and laud, in the manner of a child’s Aesop’s Fables book) might automatically be deemed “respectable”, even if the writing or acting is mediocre. In such a case, concept counts for everything, execution for little. On the other hand, a light comedy that makes us guffaw or delight in its plot twists is usually discussed in terms of its “entertainment value”. Try suggesting that such a film can have depth as well, and you might be accused of “spoiling the fun” or “seeing things that aren’t there”. But great cinema doesn’t lend itself to such polarities, and the inability to recognise that a film with popular appeal can also be a “film of ideas” is often rooted in intellectual laziness, or the need to be spoon-fed – like the reader who thinks a biography of an inspirational real-life person is by definition more profound than a genre novel. Meaning can be subtly embedded within the structure of movies whose primary function is to engage a mass audience, and it can add value without interfering with our enjoyment (or making us feel that we have to get all cerebral about the film). 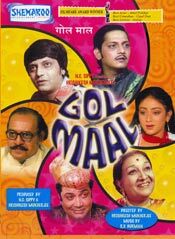 Gol Maal is, first and foremost, a delightfully funny movie, and it isn’t my intention to undermine this quality when I point out that it also contains interesting ideas about identity, the importance of treasuring the present, and not making sweeping judgements about people. None of these are pedantically imposed on the viewer – there isn’t a single scene where you might shift uncomfortably in your seat, braced for a preachy interlude – but they are there all right, and I think they enrich the viewing experience. 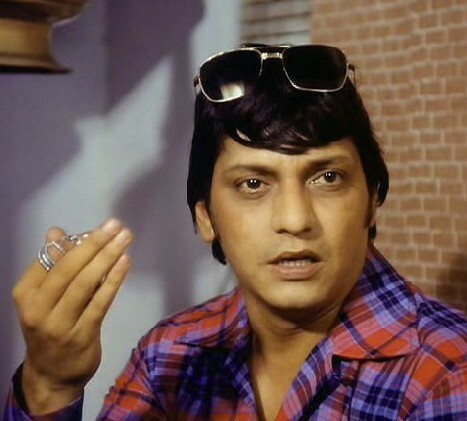 Consider the title song “Sab Gol Maal Hai”, which plays over the opening credits as Ramprasad (Palekar, in a wonderful performance that riffs on his established screen persona as the sombre, working-class man) and his goofy friends fool around at music practice. Has Hindi cinema ever given us a more economical, “fun” depiction of young people grumbling about a world where “paisa kamaane ke liye bhi paisa chaahiye” (you need money even to earn money)? It’s a lovely, high-spirited scene that works perfectly on its own terms, and yet it’s also a foundation-setter for the rest of the film: we are never allowed to forget that Ramprasad needs a job to make an honest living for himself and his (unmarried) sister, and that he is forced to go through the twin-brother charade because the man who signs his salary cheque has hidebound notions about how young people of integrity must look and behave. This man, Ramprasad’s boss Bhavani Shankar (Utpal Dutt in one of the major casting inspirations in Hindi-movie history), has many idiosyncrasies, among the most prominent being that he measures the integrity of a man by his moustache (“Jiski mooch saaf hoti hai uska man saaf nahin hota”). He reckons the country is making no progress because it is being led by old people – the future should lie with the youth – but at the same time he has unreasonably rigid expectations and is quick to make silly judgements. He doesn’t like nicknames (“Jo apna naam short kar de, woh kaam bhi chota karega”) or flashy clothes, and he believes life should be lived in carefully regimented stages: when you’re young, you should concentrate on studies and career at the exclusion of all else; later, there will be time enough for things like music and sports. 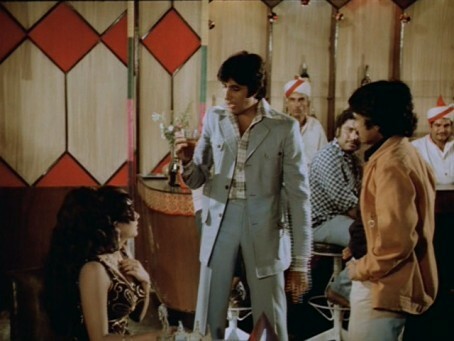 Character growth – coming of age, learning about responsibility – is a key motif in Mukherjee’s cinema, whether it’s the bad-tempered, class-conscious Vicky in Namak Haraam or the schoolgirl Guddi (whose personal growth is somewhat simplistically mirrored by the changing dress sense of the doll in the film’s opening credits). But I think Gol Maal has a deeper, more complex take on coming of age than those other films. Here, two men simultaneously mature in different ways: while the younger man takes on adult responsibilities (in his first job as well as in matters of the heart), the older man discovers the merits of lightening up and becoming more open-minded. And so, the film moves unwaveringly towards a great last shot where we see that Ramprasad has entered the “grihastha” stage of his life (which doesn’t equate to losing one’s sense of fun) while Bhavani has swallowed his pride and even dropped his precious moustache (and some of his inflexibility with it). That final image of Utpal Dutt’s unadorned upper lip is a very funny way to end an effortlessly funny film, but it’s thematically apt as well. Lovely piece. But it ended too soon! I always found Golmaal emotional. The bond between the siblings: they seemed so comfortable with each other. And how they create a family of people not related by blood: the fake mom, the kind uncle, the friends. like the film's absurdist tone especially the parts involving Utpal Dutt. It is very different from the highly deliberated sophistication one sees in a Lubitsch screenplay or in an overt satire like Dr Strangelove. The absurdist tone enables actors to improvise and leave their mark on the film (Eg: Utpal Dutt in this film, Jerry Lewis in Artists and Models). That's something one misses in a highly deliberated satire like Dr Strangelove where the writer's influence is supreme. Didn't know the Bachchan scene was from an actual movie. Thanks for the info, Jai. Golmaal and Chupke Chupke are probably my fav Hrishikesh Mukherjee movies, tho Chupke Chupke is perhaps more starry and even lighter than Golmaal (as such, there are no stakes in Chupke Chupke, so it is a movie carried solely by the performances). And there's a sequence of film shooting scenes in Guddi as well, as Guddi is sort of introduced to the 'filmi' business. I always wondered if any of them was from an actual movie or not. Unmana: thanks. Think I suddenly realised I was way past the word-count and decided to stop. Perhaps I should have taken out some of the more general stuff about "serious" vs "light" cinema. Akshay: I think all those scenes in Guddi are from actual movies being filmed around the same time. The Amitabh scene is from Parwana, the Shatrughan Sinha-Vinod Khanna one is from Mere Apne, and there are a couple of others, I forget which. Well, I seem to remember reading similar sentiments from you, more than once. But I'm guessing all readers of this column won't be followers of your blog - plus, it's a good point, and I nod along every time I read it. Very nice post, Jai. Loved the trivia. Regarding the "itni jaldi kya hai" quote, it's a play on the famous _doha_ by Kabir "kaal kare so aaj kar, aaj kare so ab / pal mein parlay hoyegi, bahuri karaigo kab?" Narayan: thanks for the Kabir doha. About "aane wala pal" - I had made the correction in this post. The version on the Yahoo site has a typo. 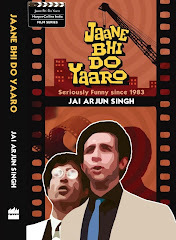 Jai, would you say that Rajkunmar Hirani is the modern Hrishikesh Mukherjee? Rahul: Scorsese's only Oscar was for The Departed which I'm told is among the least of his works. So it isn't as though Scorsese has been much honoured in mainstream Hollywood. Movies, like any other art form, must strive to say something, regardless of genre. Certain directors take the easy way out by spoonfeeding audiences with messages articulated by the protagonist (Taare Zameen Par for instance). A few others are skilful enough to bury their more nuanced thoughts beneath the narrative. In Hollywood, I've noticed that though audiences have always been smart enough to appreciate the latter category of films, the "Academy" prefers to honour the former. This is one of my favourite movies too, followed closely by Chupke Chupke. I also didn't know those scenes were from actual movies being shot. Thanks for reviving good old memories. Makes me feel like watching the movie again. Nigam: that's an interesting point. Do see this old post I did about the Munnabhai films. Those movies were more overtly serious than Gol Maal, but I thought their best scenes did capture something of the Mukherjee mood. in dev d towards the end dev is sitting in a daru ka theka(from which he eventually gets kicked out) and in the corner the protagonist of gulaal is sitting with his glasses tied with shoelaces, wearing a tacky helmet. he's just sitting doing nothing. gulaal as we know released same year later. What a wonderful piece on one of my all time favourite films! Urmila and Lakshman having their secret rendezvous at a friend's place - a converstaion she ends with Yahan baatein nahi ho sakti. Kal Juhu beach pe milte hain. Cut to Ramprasad's lesson on Kabir - Jo milte hain, woh nahi milte, aur jo nahi milte, wohi vaastav mein milte hain. Kaaran jo hai, woh nahi hai, aur jo nahi hai, wohi hai and so on, ending with Isi hone na hone, milne na milne ke beech... maya ka samudra hai. Zoom in to the painting of the "samudra" on the wall behind, and we segue into the sunset on Juhu Beach... the music strikes up with the second stanza of Aanewala pal and takes it away. 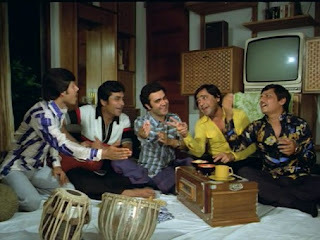 Probably a one-off sequence in all of Hindi cinema which manages to be profound, poetic and downright funny all at once. Fabulous combination of screenwriting, directing, acting and music. "Kishore Kumar’s singing and Gulzar’s writing can do that to anyone!" You forgot to mention the 3rd—& arguably most important—angle of the triangle: RD Burman. Having said that, I completely agree with your analysis of the film, & of the mistake viewers [esp. in our country] often make in labeling films as 'serious' & 'entertaining', as if the two are exclusive of each other.